Top Ten Authors I Own the Most Books Of. 1. Agatha Christie I own a lot of cozy mysteries: almost all the Cadfaels, a lot of Ngaio Marsh, plenty of Dorothy Gilman, a fair amount of Margery Allingham, almost all of Dorothy L Sayers, a few Laurie R King’s (until I decided to get rid of them because the series was descending in a way that started annoying so much I couldn’t appreciate the first ones as much anymore, nor could I see the point in keeping a few books in a series I would never finish) … but unquestionably, it is the Queen of Crime who holds the top spot on my shelves. Her books literally spill off the shelf that holds them. 3. Lloyd Alexander. I don’t own all of Lloyd’s books – yet – but they do take up significant space on my shelves. As well they should. The Prydain Chronicles, all save The High King, which I’m saving to buy as celebration for finishing Magic in Disguise, are in place of honor on my living room shelves, along with The Chronicles of Narnia and the Lord Peter Wimsey books. 6. Maud Hart Lovelace. All the Deep Valley books! All the Betsy-Tacy books (including hardcovers of the first two on the kids’ shelves), Emily of Deep Valley, and the joint edition of Winona’s Pony Cart and Carney’s House Party. If she’d written more about Deep Valley, I’d own those, too. 7. Elizabeth Enright. I have all of her books except the picture books. Like with Lovelace, if she’d written more, I’d own them too. 8. Michael A Stackpole. Technically these are in my boxes, not my shelves. When I (sadly) sold off most of my Star Wars EU collection, I kept all the Stackpole, Allston, and Zahn novels. Out of those three, I only have original novels from Stackpole. I haven’t read anything by him in years, but his books taught me an enormous amount about world-building and writing in tight third-person POV. I owe him a lot. 9. CS Lewis. All the Narnia books – between Carl and I we have three box sets of Narnia, one hardcover and two paperback; we bought a stunningly beautiful illustrated copy of The Lion, the Witch, and the Wardrobe at a used bookstore recently to give to Joy for her seventh birthday; I also own a couple Narnia companion books. Then there’s Till We Have Faces (also on my living room shelves), the Space Trilogy, and a goodly selection of his nonfiction work. 10. Miss Read. I’ve been slowly collecting Miss Read’s Thrush Green series over the years; once I complete that, I’ll begin on the Fairacre books. Nothing is better on a chilly fall or winter night than curling up with one of those and a cup of tea. They are my go-to reading for when life is getting overwhelming or bleak. I realized, writing this list, how rare it is for me to only own one or two books by an author (unless that’s all he or she has written). Usually I don’t buy anything until I find an author I really like, and then I buy everything I can by him or her, rather than scattering my affections across many different authors. There were plenty more I could have added to the list … Austen, Gaskell, Dickens, Eager, Nesbit, Wrede, Cooper, all the cozy authors I mentioned in the first point … really, it would be harder for me to find an author whose books I don’t own a wide selection of than vice versa. A creature of habit, that’s me. Check out The Broke and the Bookish for more lists! 1. Betsy Ray, the Betsy-Tacy books by Maud Hart Lovelace. When I think of book friends, Betsy is the very first who springs to mind. How I would have loved to have her as a friend when I was young, and even now, I think how much fun she’d be to have around. The great thing about Betsy is that I kept “discovering” more of her books the older I got (sneakily and well done, parents), and so we really did grow up together. I read Betsy’s Wedding shortly after getting married myself … so in some ways it feels like we are old friends who grew up and experienced much of life together. 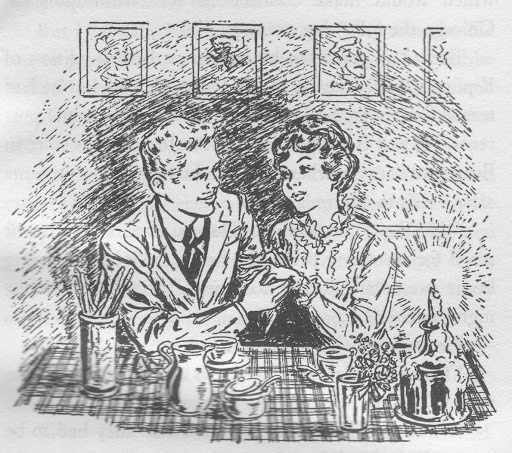 Betsy and Joe, also one of my very favorite literary couples! 2. Lucy Pevensie, Tarkheena Aravis, Chronicles of Narnia by CS Lewis. No offense to Susan or Jill or Polly – I like all of them, but it’s Lucy and Aravis I’ve always wanted to have as friends. Could you imagine the trouble we’d get into? It’d be awesome. 3. Randy and Rush Melendy, The Melendy Quartet by Elizabeth Enright. Re-reading all of Enright’s books recently reminded me again of how much I love this brother-sister team, and how badly I wanted them to be real people and my next-door neighbors when I was a kid. 4. Miss Marple, Agatha Christie. Dudes, can you imagine a better friend? No matter what’s going on in your life, Aunt Jane would have some gentle wisdom and humor to impart, and she would keep you from every being too conceited. 5. Sophie Hatter, Howl’s Moving Castle etc, by Diana Wynne Jones. SOPHIE. I want to hang out at the playground with Sophie, while my kids play with Morgan, and just talk. And then I want to foist our respective children off onto the husbands so Sophie and I can keep talking, without having to parent or wife at the same time. 6. 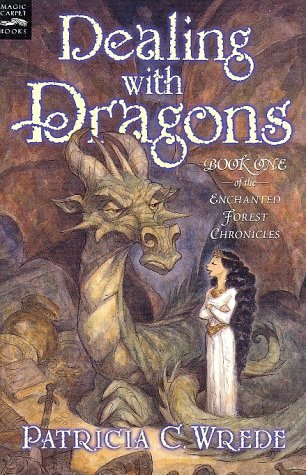 Princess Cimorene, the Enchanted Forest books by Patricia C Wrede. Cimorene is another that I want to have as my friend now, not just as a kid. The younger Cimorene is awesome enough, but grown-up, mother-of-Daystar Cimorene is awesome as well, and I hope someday Wrede writes about some of Cimorene’s adventures between when Daystar was born and when he set off to rescue his father. Because we didn’t get to see nearly enough of her Being Awesome in Book 4. I love Cimorene’s expression on this cover. It sums her up so well. 7. Tiffany Aching, Wee Free Men etc by Terry Pratchett. I actually think I’d like to hang out with Granny Weatherwax and Nanny Ogg as well, but Tiffany is the one I’d most want to be friends with. 9. Molly Gibson and Roger Hamley, Wives and Daughters by Elizabeth Gaskell. I swoon more for Margaret and Mr Thornton from North & South, but I’d want to be friends with Molly and Roger. Both because I think they could use some like-minded friends, and because I think they would make wonderful friends in return. 10. Joy-in-the-Dance, Lucian, et al from The Arkadians by Lloyd Alexander. I love all of Alexander’s characters, from all his books, but it’s the main cast of the Arkadians who most make me want to dive into the book and go adventuring with them. I wish he’d written more than one book about them all – I’ve always wanted to know what they did next. And that, my friends, is my top ten. It surprised me, when I started writing it, how many of my favorite books and characters do not appeal to me as friends, however much I may love them for themselves (Lord Peter and Harriet, for example, I think would make me feel utterly stupid and inadequate, and that’s not exactly good for a friendship). Some of my opinions have changed since childhood, also – once upon a time, Anne Shirley would have been my ideal friend, but now I have a sneaking suspicion she would exhaust me after every visit. I haven’t outgrown her, but I have outgrown her friendship. 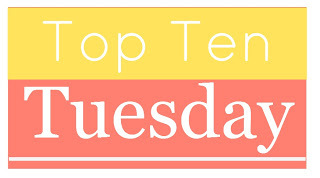 To see others’ top ten characters who … lists, check out The Broke and the Bookish. Happy reading! I’ve been reading through Elizabeth Enright’s books lately – just finished the Melendy quartet, and am waiting for my paperback editions of Gone-Away Lake and Return to Gone-Away (I stole borrowed my mother’s old, old hardcover editions when I moved away from home, but they are so old that they’re starting to crumble, so I decided to pick up some cheaper paperbacks to read without having to wear white gloves) to get here on Monday so I can go through those, as well. Then there’s Thimble Summer to be read somewhere in there as well. So, with this being my book diet lately, you can imagine my delight yesterday, when the kids and I were out enjoying the sunshine down by the pond, to see three little boys half-hidden in the bracken and murk on the other side. It looked like they were building either a fort or a raft, chattering away as they did so, busy as beavers and happy as could be. I couldn’t have conjured up a scene more perfectly reminiscent of Enright’s worlds if I’d tried. I’ve read some reviews that accuse her books of being too sweet, too saccharine, too unrealistic in their portrayal of children and the world. Nonsense, I say! Simple and wholesome, yes, but not impossible. Her children aren’t “little dears” who are sugary sweet and live in a ridiculously perfect world. In fact, they remind me a lot of myself as a kid – imperfect people, living in an imperfect world, but filled with the joy of just being alive, and being a kid. So I was extra glad yesterday, on a day of glorious, perfect spring, a day that made me want to sing along with all the birds and turn cartwheels if I knew how, to see that childhood, to a certain extent, remains the same throughout all generations. Another one of the few non-fantasy authors who have been an enormous influence on my writing and my life, Elizabeth Enright doesn’t get anywhere near the appreciation she deserves, in my opinion. Which sounds odd, considering she won a Newbery Medal for Thimble Summer. It’s been my experience, however, that most people get a blank look on their faces when you mention Enright’s name, and then only vague recognition comes with the mention of Thimble Summer. I thoroughly enjoy Thimble Summer, but it can’t hold a candle to my favorites of hers – the Gone-Away books. Whether it is the close relationship between a boy cousin and a girl cousin, reminding me so happily of the friendship between my cousin Zach and me, or the idea of a hidden, old-fashioned community, or (in the second book) all the fun of renovating an old house (which, having lived through, is Not Really Fun At All, but Enright made it seem fun), and moving to the country after having lived in the city … whatever it was, the books were a delight. I especially like that, unlike so many YA and MG books, the adults are present and involved, while the children still have freedom to explore and be brave and get themselves in and out of trouble. We need to see more of that in books for young people! Then there’s the Melendy Quartet. I’ve written in my favorites posts about this family – Randy and Rush and the family overall. I love them. I want them to be my next-door neighbors. I want to have had Randy and Rush to adventure with as a kid, and I want them all to be my kids’ friends. They are real, and delightful, and funny, and brave (and occasionally not), and ambitious, and loyal and loving. I think what I like best about Enright’s books, and her characters, is that perfect blend of realism and idealism. While the Melendy gang have marvelous adventures and impossible luck, they also feel like real people, people you could meet any day walking down the road. Same with Portia and Julian and the rest of the Gone-Away crew. As for Garnet of the wheat-colored braids, despite living in the hardest of times in American recollection, the Great Depression (a farmer’s daughter, no less), there is no grimness in her; she still exudes the natural joy of childhood, mixed with a very real worry for her parents’ livelihood. Another factor that has always personally influenced my delight in Enright is the friendship that exists between boys and girls, without any romance or foolishness, just very easy and natural. 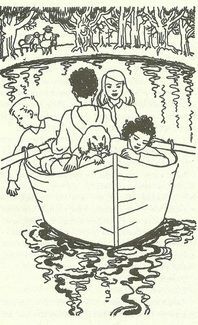 Garnet and Jay and Rush and Randy are, true, brother and sister, and Portia and Julian cousins, so romance would be quite ick in their cases, but so many writers only seem to capture the squabbling side of boy-girl family relationships, or the exasperation each feels for the other. There is some of that in Enright’s books, as there is in life, but there is also the deep and meaningful friendship that only comes when boys and girls are friends with each other, instead of boys only being friends with boys, and girls only being friends with girls. I love that Enright shows those sorts of friendships are possible, instead of assuming there must always be this unfathomable chasm between the two. Ugh! No wonder we have such problems with gender discrimination; it is so ubiquitous, even in children’s literature! Whenever I want to capture some of the sense of my childhood, I re-read an Enright book. And in my writing, I try to keep in mind how natural and fun her characters all are, regardless of the book’s setting. When children who were created sixty, seventy, eighty years ago feel more real than children written about today, you know something has been done right! Are you familiar with Elizabeth Enright? If so, which is your favorite book? What are some books you can think of that feature really excellent boy-girl friendships, without any hints of romance?